"Fast and Easy Flat Field Images"
If you're not doing flat images with your astrophotos, you're missing a very important step that can greatly improve your images. Flat images corrects optical imperfections in your imaging train such as dust motes and vignetting. Astrophotos are not like typical daytime pictures. In order to reveal the faint details, we must stretch the histogram of our images. When doing this, optical imperfections are greatly magnified. The Spike-a Flat fielder can correct those imperfections quickly and easily! To use the panel, point your telescope at zenith (straight up) and place the panel gently on top of your telescope. Center the panel for the best results. Take your flats on your schedule. No need to wait for the narrow window at twilight. Take them before or after your imaging session, or even the next day! What are the dimensions of the flat fielders? The standard flat fielder measures 15" x 15" x 1" and weighs 4lbs, 9oz, while the large measures 20.5" x 20.5" x 1" and weighs 8lbs, 1oz. What technology is used in the lighting? Our panels use edge-lit LEDs with multiple layers of diffusion material to achieve an extremely flat field. In our testing we found the panels provide an evenly illuminated field to within approximately 1% across the panel when used as instructed. In fact it was flat to the limit of our equipment which tested about a 1% variation due to pixel variation in our camera. Can I use a narrowband filter such as Ha? Yes, the Spike-a Flat Fielder can work with Ha filters. You must adjust the dimmer to a bright setting and take slightly longer exposures (typically a few seconds) but it works just fine. I have a remote observatory. Can your panel be mounted on a wall? Do you have a computer controlled version? We have many customers who mount their Flat Fielders permanently in their observatories. Just be sure the panel is perfectly perpendicular to the scope and be sure to not have any stray light inside the observatory. 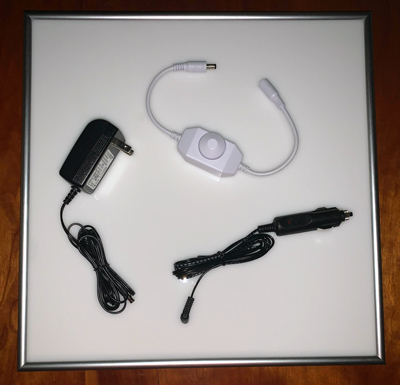 We now sell a separate computer controlled USB Dimmer unit that will allow you to control the brightness level remotely. Can I use a battery to power the panel? You can, but it is best to use a regulated power source. The panel can be powered with as little as a single standard 9v battery, but we found that the histogram would change slightly between subs as the voltage changes over time which means stacking the flats would not be as precise as it would with a regulated power supply. If you are not satisfied for any reason, return the panel in its original condition for 60 days for a full refund minus shipping. Do I need to keep the focus point the same between imaging and taking my flats? The answer is 'it depends'. We studied several models of telescopes and found that fast newtonians were fairly sensitive to the focus point- see this thread on CloudyNights with the results. However, small temperature-based focus changes would not affect the flat images. As long as you don't move the focuser between imaging and your flats (even if several days have passed), you can still take your flats. As long as nothing changes in your imaging train- camera rotation, filter, etc you should be good to go. The Schmidt-Cassegrain telescope we used in testing showed virtually no focus-based changes in the flats across the focusing range. Do I need to take separate flats for each filter? You should because each filter may have a different pattern of dust which could slightly affect the colors of your finished images. However many people just take one set of flats with a lum filter and use them with all color channels to correct vignetting. Since the Luminance channel will be providing most of the 'details' of your images, the color filters are not quite as important to the final product's details. Keep your filters clean, though! Do you sell smaller panels? We tested a small prototype, but because of the way the edge-lighting is designed, we could not achieve the same level of flatness across the field. Also, the cost of manufacturing the smaller panel was similar to the larger panel and would result in almost no cost savings. Our standard size panel works very well with telescopes from 66mm to 305mm (up to 12" mirror). You may also mail or fax your order to us. Click Here for a printable order form.